Back in 1995, five of the finest folk, blues and soul singers of their generation found themselves at the Cambridge Festival. They decided to sing some songs together ... magic happened and Daphne's Flight took off. A widely acclaimed UK tour and a prestigious date at London’s Union Chapel soon followed. The project has been seen as marking a turning point in the role of women within the English folk movement. In 2017 these five remarkable musicians decided to sing together once more, with a brand new album and sell out tour, it was such a hit they’ve decided to do it again. 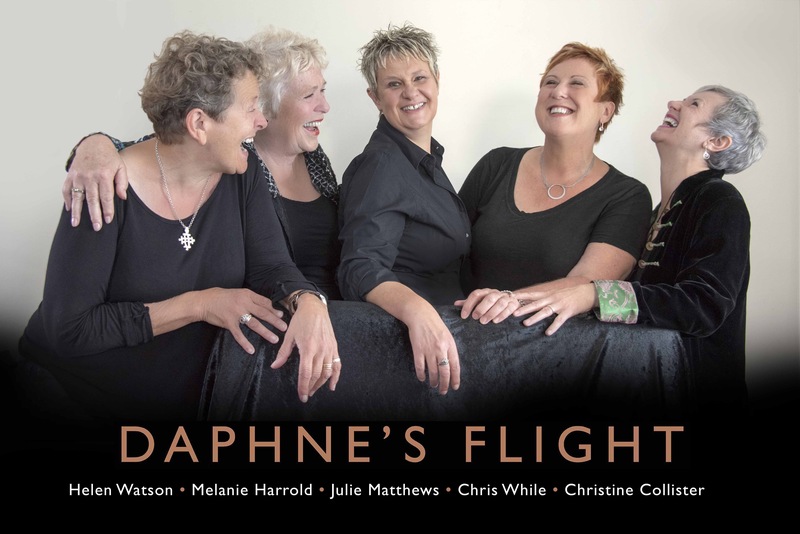 Daphne's Flight are all contemporary songwriters who cross a huge range of topics and genres, blending folk, blues, jazz and pop whilst also dipping into new and vibrant arrangements of classic covers such as the Beach Boy's 'God Only Knows' and Elvis Costello's 'Ship Building'. All are woven together with striking harmonies and supported by a range of instrumentation and percussion. An evening with Daphnes Flight will be filled with energy, humour and passion. In the two decades since Daphne's Flight were together, Christine Collister has released 11 albums and a DVD celebrating 20 years of performance (2003) and continues to tour the globe. Melanie Harrold, as well as being a vocal therapist now runs and arranges for 2 celebrated London choirs. She released a live CD of her own music in 2013. Chris While and Julie Matthews have been a duo for 22 years receiving 10 BBC Folk Award nominations and winning in the best duo category in 2009. As well as their extensive tours which take them around the world, they have released 10 studio albums and are members of the celebrated Christmas band, St Agnes Fountain. Since 2006, Julie has been a leading writer for the BBC Radio Ballads. Chris tours each year with her daughter Kellie. Helen Watson has released several solo albums as well as recordings with Burden of Paradise, which features the mighty Snake Davis and The Love Notes, a respected all female a Capella group.